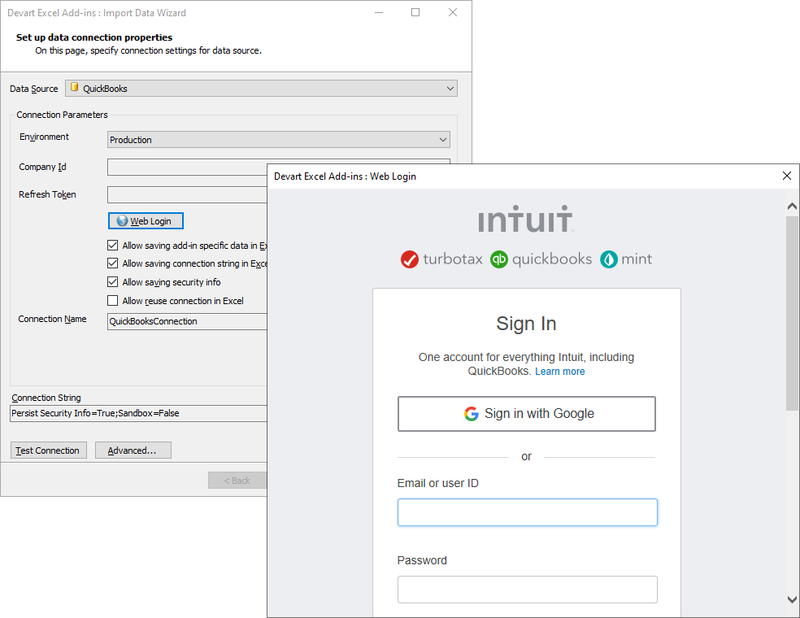 Devart Excel Add-in for QuickBooks allows you to connect Excel to QuickBooks Online, quickly and easily load data from QuickBooks to Excel, instantly refresh data in an Excel workbook from QuickBooks, edit these data, and save them back to QuickBooks. It enables you to work with QuickBooks Customers, Transactions, Invoices, Sales Receipts, and other objects like with usual Excel worksheets and apply all the Excel's powerful data processing and analysis capabilities to these data. To link Excel to QuickBooks you need to click Web Login and sign in to QuickBooks, then select a company to query data from and authorize Devart Excel Add-ins to access QuickBooks data. Connection information may optionally be stored in the Excel file, or you may reenter it whenever necessary. 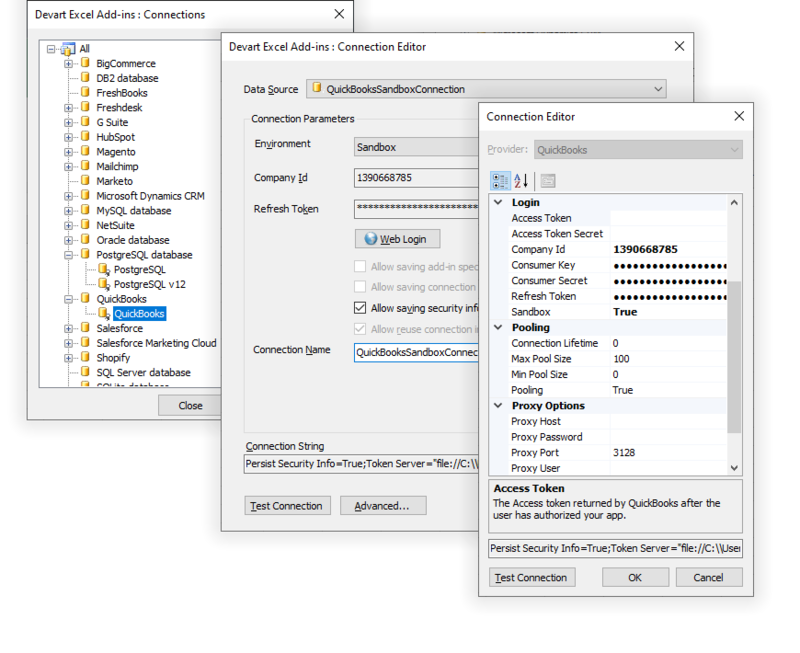 In addition to storing QuickBooks connection in the Excel file, you can also store QuickBooks connections in the registry on your computer. This allows you to quickly reuse previously configured connections to link QuickBooks to Excel. All you need is to select a connection in the list. You may store connections on your computer independently from storing them in the Excel file. 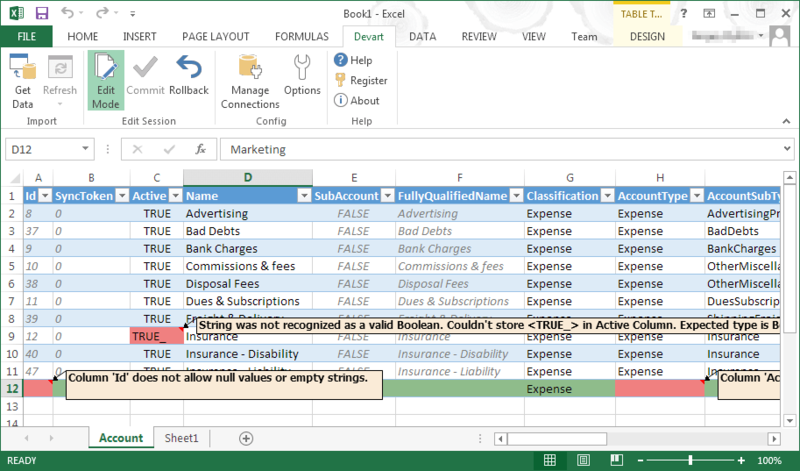 Thus, you can reuse them on your computer and have your Excel connected to QuickBooks even if you want to share Excel files with QuickBooks data without sharing connection parameters. Visual Query Builder allows you to choose a table to import data from, select the columns from this table and related tables, and set filter conditions and data ordering options visually. If you need to select data more precisely, you can use SQL to select data you need. 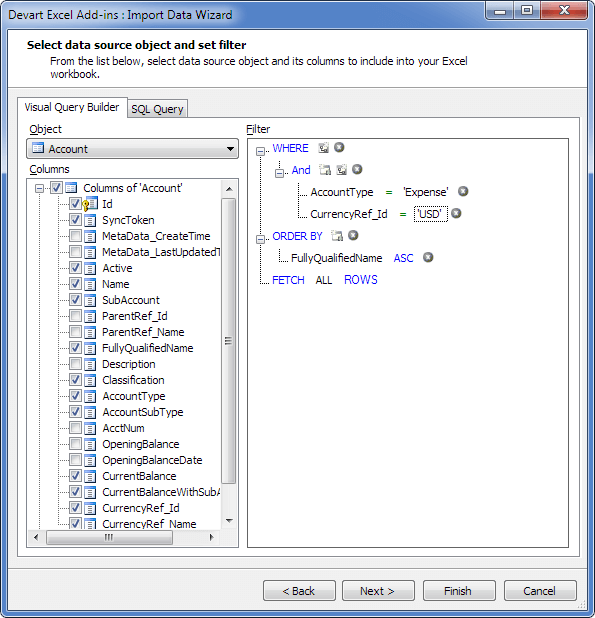 Devart Excel Add-in for QuickBooks provides advanced SQL support for QuickBooks, and allows you to use complex SQL queries to get exactly the data you need. Before finally importing data you can preview data and verify the query in a Data Preview window. It's very convenient to always have fresh data from QuickBooks right in your workbook. 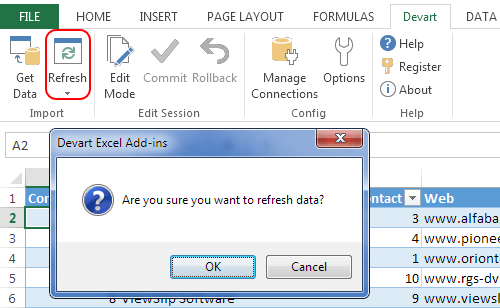 Imagine, you have performed data analysis in your Excel workbook, built some charts for your QuickBooks data, and you can re-read data from the source and update all this to the current state by just clicking a button on the ribbon whenever you need. To edit QuickBooks data in Excel you need just to click the Edit Mode button on the ribbon before editing, and then you can edit data just like you usually do it - add or delete rows, modify cell values, etc. All the changes are highlighted so you can easily see which data is changed. After you finish editing, simply click Commit to write changes to QuickBooks or Rollback to cancel changes. Devart Excel Add-in for QuickBooks instantly validates entered data and highlights errors, such as incorrect dates, duplicate primary key values, etc. Order all 23 Devart Excel Add-ins in one Universal Pack and get a fantastic discount! If you need add-ins only for cloud applications, you may order Devart Excel Add-in Cloud Pack. 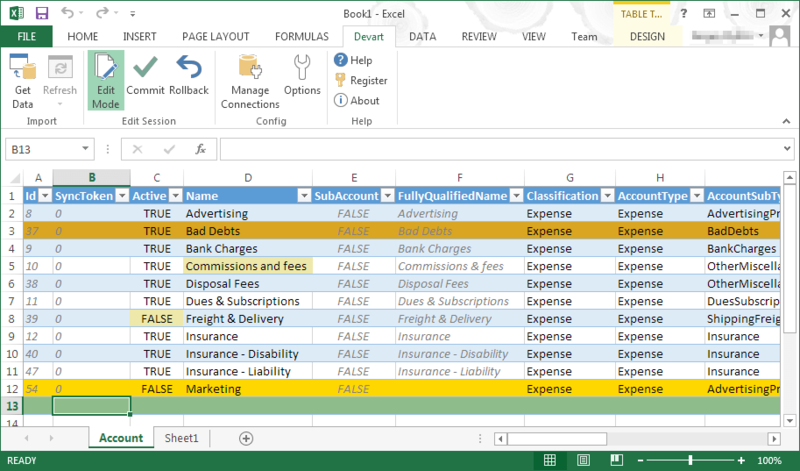 For databases, there is Devart Excel Add-in Database Pack available.